Australia’s official cash rate will remain at 1.5 per cent following the RBA’s monetary policy meeting today. The RBA has announced the outcome of August's monetary policy meeting, which resulted in the official cash rate remaining 'on hold' at 1.5 per cent. Today's decision marks the 22nd consecutive meeting that the RBA has sat on its hands (the bank meets every month except January). The last movement was in August 2016, when the bank cut from 1.75 per cent to 1.5 per cent. Today's announcement does not come as a surprise to the market, which was pricing in a 100 per cent chance of 'no change' to the RBA's official cash rate. 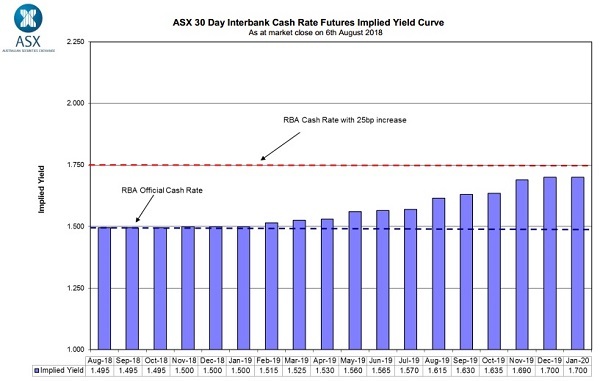 The consensus among economists is that the RBA will not hike again until late 2019 or early 2020, which is broadly in line with the implied yield curve of the ASX futures market (see chart below).